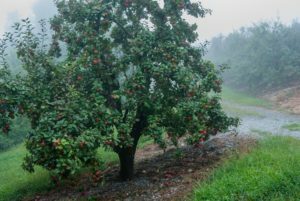 Three key insect pests are of concern at this time, including codling moth (whose populations are declining), brown marmorated stink bug, and apple maggot. With codling moth degree day (DD) accumulations ranging from about 1975 in Henderson County to 2350 in Lincoln County, we are nearing the end of second generation flight throughout the region. Pheromone trap captures have been relatively low in the majority of orchards, but there are orchards that continue to have high trap captures and insecticides effective against this pest should continue to be applied. First generation brown marmorated stink bug emergence is picking up steam at this time. In higher elevation orchards (about 2000 ft), pheromone trap captures have increased during each of the past two weeks, and the major emergence is expected to occur in the second to third week of August. BMSB control in these areas will be particularly important from mid-August to mid-September. Off the mountain in Burke and Lincoln Counties, first generation adult emergence has been underway for the past several weeks. Overall numbers have been relatively low in our sample sites, but the threat of damage is expected to continue through the end of August. Finally, apple maggot trap captures have been very high for each of the past two weeks. While orchards near non-sprayed orchards are at greatest risk, this insect often appears in orchards far from abandoned sites. Hence, if not trapping in individual orchards, one should assume a high risk for this pest. Pyrethroid insecticides are commonly used at this time for BMSB control, and will also protect crops against apple maggot and oriental fruit moth. However, pyrethroids are generally weak against codling moth, so in those orchards with codling moth problems, the addition of Altacor or Delegate (whichever was not used against the first generation) should be considered. There are several premixes that include group 28 insecticides (active ingredients in Altacor and Exirel) with either lambda-cyhalothrin (Besiege – 14 day PHI) or thiamethoxam (Voliam Flexi – 35 day PHI) that are options for control of both codling moth and BMSB in those orchards that did not use Altacor during the first codling moth generation. The degree day (DD) models predict adult emergence and egg hatch of each generation. They do not predict the intensity of populations, which can be assessed by using pheromone traps. Hence, the models should be used to help gauge the time period when control is most likely needed, and pheromone traps provide information on the need for and frequency of insecticide applications. For full details, read “IPM Practices for Selected Pests” in the Orchard Management Guide.